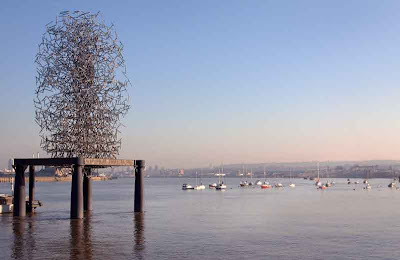 Apparently "algebra is the relationship of relationships", and the inspiration for this sculpture, by Antony Gormley called "Quantum Cloud". It stands at the end of the QEII pier on the Thames by the O2 dome. Looks more like a bad hair day to me. Or a bottle brush! Awesome shot of it, though! I love variation in the color of the sky and the sailboats! In my next life, I'm coming back as a modern artist. Since I never understood algebra, I also don't understand this sculpture! EXCEPT now I SEE why I didn't understand it. Nice picture. Your comment made me laugh. I agree with you. It looks like birds gone amok to me. But the beautiful skyline shot well makes up for it. Beauiful,Lovely and fantastic shots !! Great post. Sculpture? Mmmm... I prefer anything else in this photo ... I I know, I'm not an artictic temper. Never good at algebra either! I thought it was a new-fangled Christmas Tree at first! Great shot though. :-) Is this ART bought by the council ?? Well, if you want to see a copy of the artist, you will see him in todays posting from Stavanger. It looks exactly as my brain did while I was studying quantum physics at the Uni! Great photo! Oh, I love Antony Gormley's work. I saw an exhibition of his at the Hayward Gallery a couple of years ago, and he's seriously talented. Great blog; just stumbled across it and I love it!